Appearance of Beaujolais Nouveau bottles in the wine stores squarely underscores an important notion which is up in the air anyway: the holidays are here, and the year is going to wind up very quickly from here on. But the last six weeks of the year are not going away without a bang – there will be lots of great food and great wine everywhere. 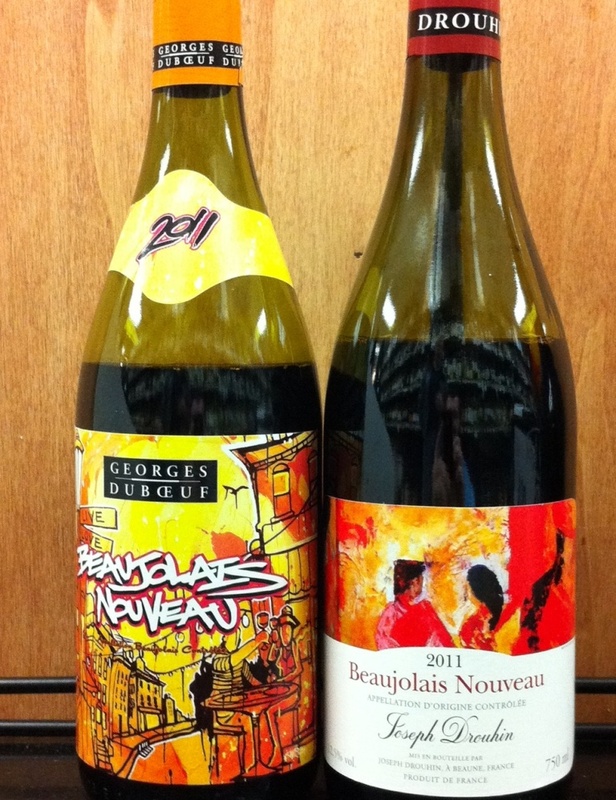 So what do you think about Beaujolais Nouveau 2011? Here are my impressions. To begin with, I like the label of the Georges Duboeuf Beaujolais Nouveau 2011 – it is very bright and attractive, purely an urban statement with graffiti lettering. As as the wine itself is concerned, it was okay, more in style with the years prior to 2010. Let me put it this way – the Beaujolais Nouveau 2010 was real wine of a good depth, a thought provoking wine (here is the link to the post about 2010 wines) – 2011 Georges Duboeuf Beaujolais Nouveau was just that – a Beaujolais Nouveau wine which can be gulped quickly without much reflection. Bright fresh fruit, very grapey – but in need of an overall balance. I liked the taste of Joseph Drouhin Beaujolais Nouveau 2011 more, as it was combining brightness of the fresh fruit with an overall structure – this wine had legs to stand on, had a nice balance with good acidity and some earthy notes – this will be one of the wines I want to see on our Thanksgiving table (we will talk about Thanksgiving wines in the next post). 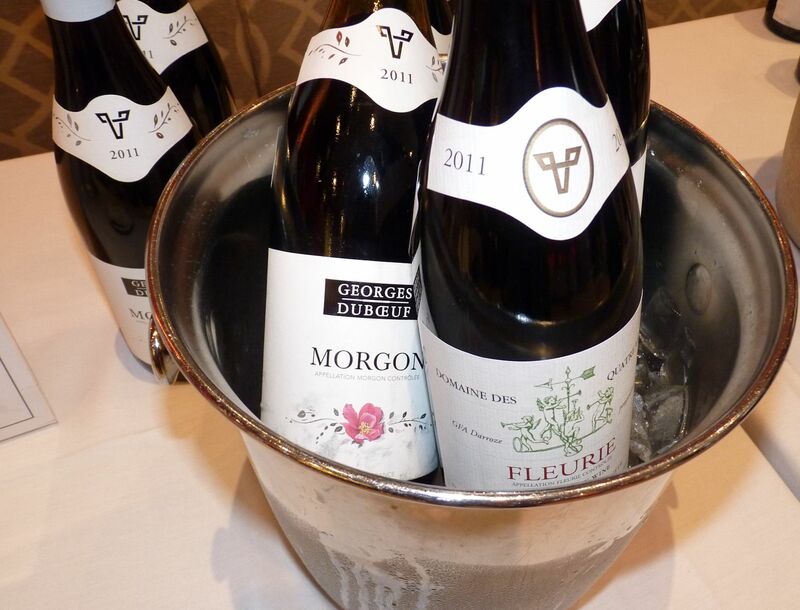 In any case, drink your Beaujolais Nouveau quickly – these wines are not meant to be kept for the long time. If you are puzzled by the title of this blog, let me explain. No, Scotch has nothing to do with Beaujolais Nouveau – I just happened to stop by Cost Less Wines last Wednesday and try more Scotches from Douglas Laing. Here are some which I would like to note: Linkwood 13 from Speyside was very light, with a hint of smoke and most interestingly, with grape finish. It is very interesting, as it was not finished in any of the wine barrels – it was actually finished in used bourbon casks. Next, outside of getting into “smoky” category, the Scotch I liked the best was Clynelish 15 from Highlands – it was both very complex and smooth. Complexity is something which I really enjoy in the Scotch (this is why Macallan is never my favorite – I don’t find enough complexity in the taste). Finally my most favorite Scotch from this tasting was Caol Ila 14 from Islay – pronounced smokiness and power, a great scotch if you are into smoky flavors at all. Overall, it was great #WhiskyWednesday, as they say it on Twitter. The next time I want to talk about Thanksgiving wines – but please tell me, what wines will be on your table on Thursday? What’s up with the “live blog”? No, I don’t plan to show the live recording in the Gary V. style (for those unfamiliar with Gary V. – please go to the Wine Library TV site, I promise you will enjoy it). For all of my posts so far, I don’t write them at the same time as I taste the wine or visiting the restaurant. Yes, I might take some notes, but all of the writing is still done later on, mostly based on the memory (yes, I make an effort to memorize the experience). 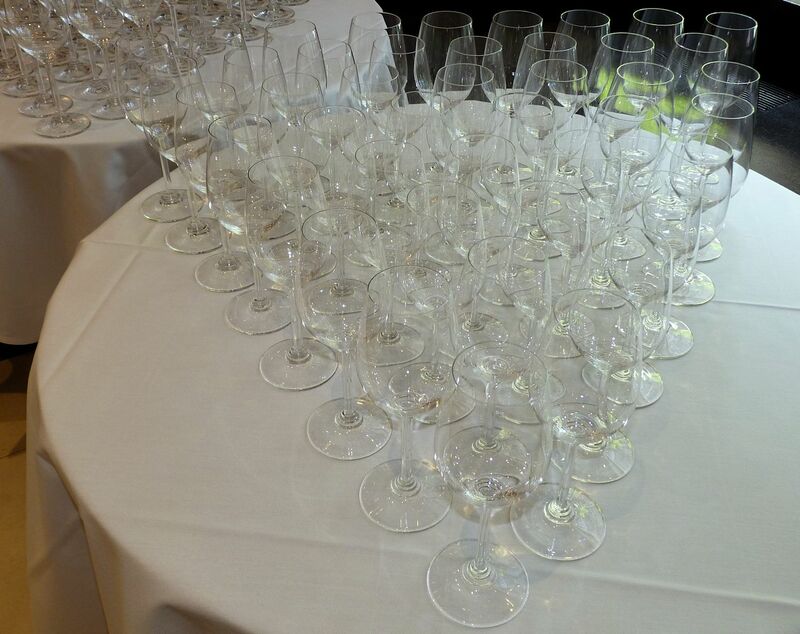 However, today is a special day for many wine lovers across the globe. In the 1970s, the tradition started in France, in the appellation called Beaujolais, to celebrate the first wine produced from the harvest of the same year. What was the French national event in the 1970s, now became a worldwide celebration, which always takes place on the third Thursday in November, and today is the day. Beaujolais red wines are made from the grape called Gamay, and the wines are produced in the style of the neighboring Burgundy (which are made from Pinot Noir), but typically are lighter and don’t age that well. When it comes to the Beaujolais Nouveau, this wine is made in 6 weeks after the harvest, so it is really light and fruity wine which is not supposed to age (should be consumed by May of the following year). 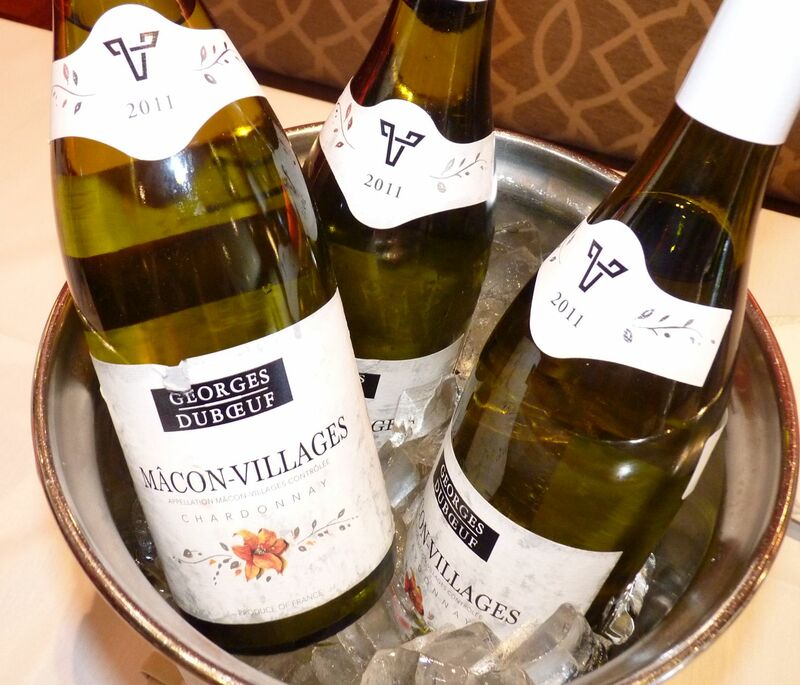 Also, similar to the Pinot Noir wines, Beaujolais wines should be served slightly chilled (about 55F). Therefore, considering such a special day, I’m writing this blog as I actually try the wines, starting with the opening of the bottles – and this is why I called this blog “live”. I can also tell you that last year, even before I tried the wines from 2009, I read somewhere that they supposed to be very good wines, so I was already influenced as I was trying the wines (read my previous post if you are curious why is that). This year, I have no expectations whatsoever, except the knowledge that these are young wines and they will taste accordingly to the very young age. 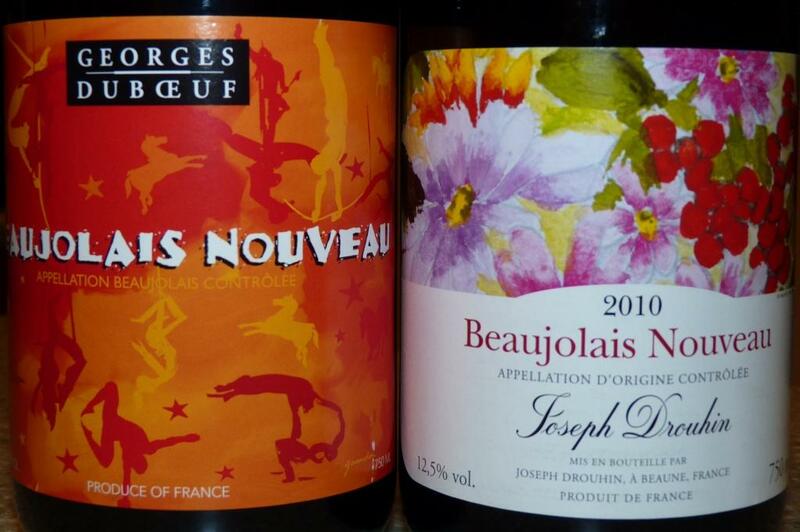 I decided to try Beaujolais Nouveau from two very famous French producers – Georges Duboeuf and Joseph Drouhin. 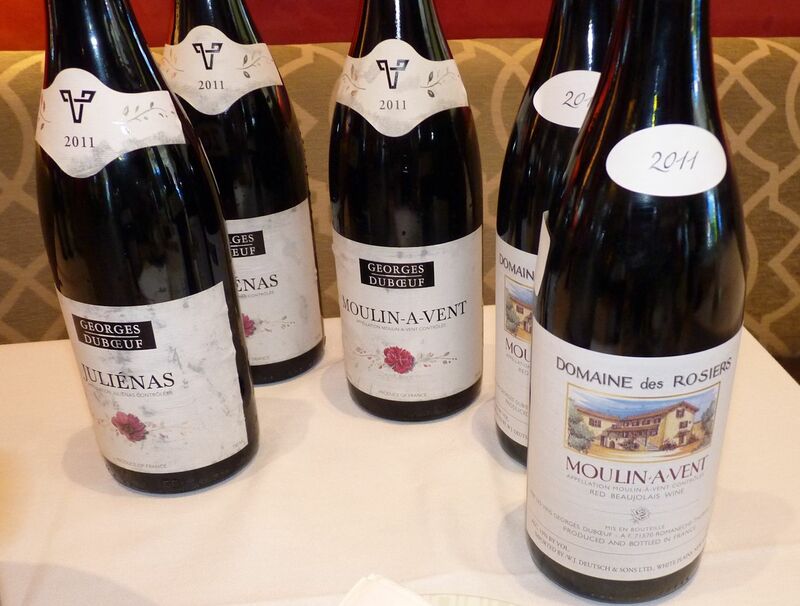 The first producer, Joseph Drouhin used regular cork, and Duboeuf used synthetic one, both corks specifically imprinted for 2010 Beaujolais Nouveau. From the moment the bottles opened, Joseph Drouhin exhibited tremendous aroma of a fresh grape coming strongly right from the bottle, and for Duboeuf the same aroma was also noticeable, but less prominent. From here on, let’s diverge and talk about two wines separately. Georges Duboeuf. Beautiful very intense dark garnet color. Nose is very solid, doesn’t have any off flavors which are common with very young wines. Cherries and raspberries are noticeable on the nose. 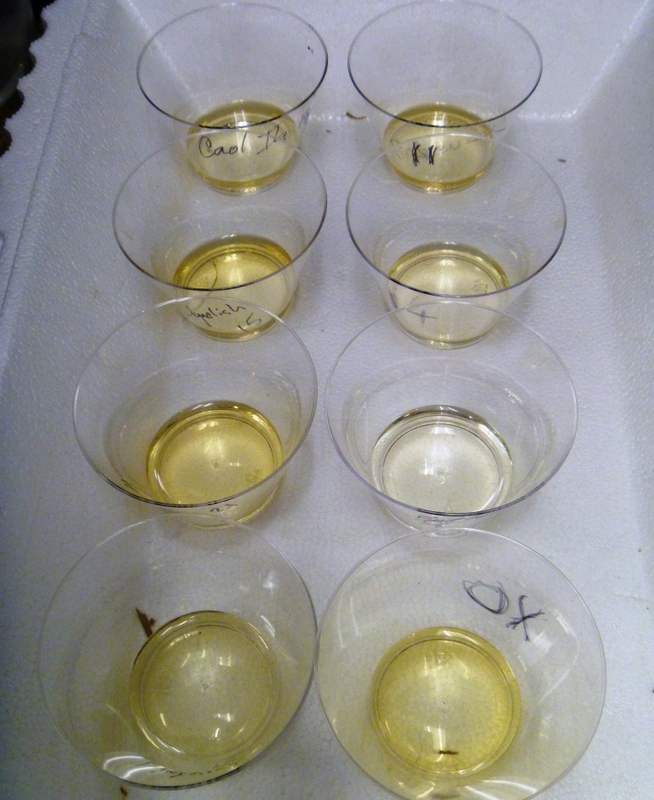 With the first sip comes first surprise – the wine has very noticeable tannins. I don’t remember ever tasting the tannins in the Beaujolais Nouveau wines – wonder if this is the style of Duboeuf, but in any case that was a surprise – rather a good one, however. In addition to the cherries I can pick up some plums on the palate, all complemented by good acidity. This wine can be perfectly enjoyed by itself, but will also work very nicely with the wide range of lighter dishes or mild cheese. Considering the price of about $10 per bottle, this wine has great QPR. Joseph Drouhin. The color is nearly identical – nice deep garnet. Nose is similar to Duboeuf, again without any off flavors. In addition to cherries I would say that there is a hint of strawberries, and again to my surprise, I would probably add a hint of white pepper to that bouquet, which is not something I would typically associate with Gamay grape. On the palate, I would dare to say that this wine has more flavor. I practically don’t pickup any tannins, but instead, there is a great amount of nice supple fruit (again, cherries, plums, raspberries) and very refreshing acidity – oops, and now tannins are coming in approximately 30-40 seconds after the sip of wine. Wow! If the first wine was good, this one is even better – and again, amazing QPR at $11/bottle.